U.S. Soccer defended its decision to let Hope Solo continue to play for the women's national team despite her arrest on allegations she assaulted her sister and 17-year-old nephew in June. 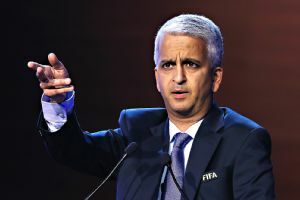 In a statement issued Monday night, U.S. Soccer president Sunil Gulati said the federation would stand by its decision to allow due process to take its course before ruling on Solo's national team status. "From the beginning, we considered the information available and have taken a deliberate and thoughtful approach regarding Hope Solo's status with the National Team," Gulati said. "Based on that information, U.S. Soccer stands by our decision to allow her to participate with the team as the legal process unfolds. If new information becomes available we will carefully consider it." The statement was issued hours after U.S. Olympic Committee chief executive Scott Blackmun called the allegations against Solo "disturbing and inconsistent with our expectations of Olympians," but he stopped short of saying she should face immediate disciplinary action from the team. "We have had discussions with U.S. Soccer and fully expect them to take action if it is determined that the allegations are true," Blackmun told USA Today Sports in an email. U.S. Soccer president Sunil Gulati said the federation is standing by its initial stance to let Hope Solo play until her legal matter is settled. On Sept. 13, Solo collected her record 72nd shutout with the national team in an 8-0 win over Mexico. She shut out Mexico again in a 4-0 win Thursday. Nike also issued a statement Monday standing by the U.S. goalkeeper pending developments in her legal situation. "We are aware of the allegations and that Hope Solo has pled 'not guilty' to the charges. Hope remains a Nike athlete and we will continue to monitor the situation," the statement said. Solo pleaded not guilty to two counts of fourth-degree domestic violence in June and is scheduled for trial Nov. 4. She faces up to six months in jail if convicted. She is accused of assaulting her sister and 17-year-old nephew at her sister's home in suburban Seattle in June. Her lawyer Todd Maybrown says the goalkeeper was a victim in the altercation. Solo's November trial date means she won't miss time with the Seattle Reign of the National Women's Soccer League or October's CONCACAF qualifying tournament for the 2015 World Cup in Canada. "I understand that, as a public figure, I am held to a higher standard of conduct," Solo said in June. "I take seriously my responsibilities as a role model and sincerely apologize to everyone I have disappointed." Solo married former Seattle Seahawks tight end Jerramy Stevens in 2012. He was arrested just before their wedding for investigation of assault after a disturbance involving Solo, but he was not charged. Maybrown also represented Stevens in that case. Solo, 32, has won two Olympic gold medals with the U.S. women's national team.